Woah, this is one very tall tree. Nine years ago, it was the tallest known plant in the world. (See if you can spot the three people, blue shirted, hanging at different points on the trunk). It's 369 feet high. That's about twice the size of the Statue of Liberty (minus the foundation). I like this tree. The people who discovered it have never revealed its true location, which is somewhere in Humboldt Redwoods State Park. And though it's got a nickname, "Stratosphere Giant," it is no longer the giant. It's been trumped. 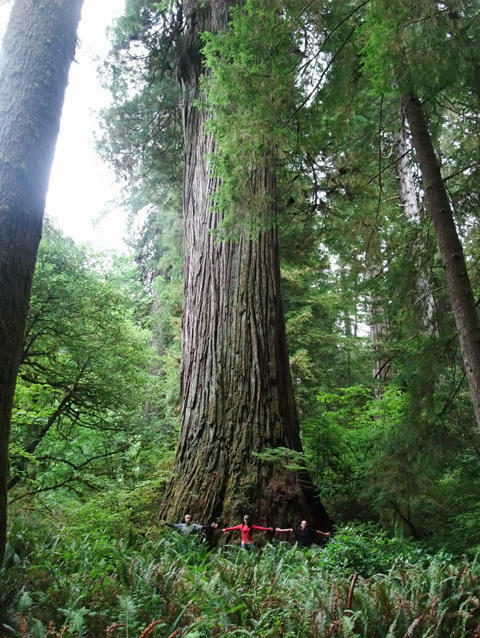 After its short four-year reign as World's Tallest, two hikers, Chris Atkins and Michael Taylor, were deep in another section of another park, Redwood National Park (purchased in 1978 during the Carter administration) when they came across a new stand of trees, taller than anyone had ever seen before. The tallest of the tall is 379 feet 4 inches, 10 feet taller than the Giant. It's now called "Hyperion." Once again, no one is telling where the new champ is located. People will want to see it, photograph it, climb it, carve little souvenirs out of it. Trees, says Steve Sillett, are not like people. They "cannot run away from paparazzi." He asked us not to even mention the nickname, "Hyperion," but I figure the nickname gives away nothing. Anyway, the Who's Biggest title keeps changing. According to Nalini Nadkarni, a professor at Evergreen State College, there is so much wood in this tree, called Del Norte Titan (discovered by the same Steve Sillett who climbed Hyperion), "its mass is equivalent to 15 adult blue whales, the largest animal on earth. Each year, this tree produces enough new wood to make a 90-foot-tall tree with a trunk 12 inches in diameter. If all of Del Norte Titan were cut into boards one foot wide, 12 feet long and one inch thick, the line of planks laid end to end would stretch over a hundred miles and could build 120 average-sized houses." But nobody's going to be chopping up Del Norte Titan. Donald Trump can drool all he likes, but these 15 blue whales' worth of lumber will stay vertical somewhere in Jedediah Smith Redwoods State Park in California, breathing like trees do, pulling CO2 out of the air and giving us back oxygen. That's the real gift of trees. Yes, we live under roofs made of wood, surround ourselves with woody things, but — basically, what we breathe out, they breathe in. Some things are still that simple. The photo collage of the Stratosphere Giant was created by photographer James Balog; Nalini Nadkarni's book on trees is "Between Earth and Sky: Our Intimate Connections to Trees (University of California Press, 2008); Bill Yake's poem is called "Inside Out."